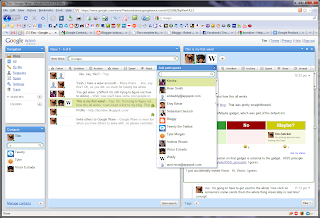 I just got in on the Google Wave preview. I immediately had 8 invites, of which I have used 4, so far. The first one went to my wife, of course. I like it. I think it has awesome potential. It's a "preview" (a.k.a. "beta"--or, since we're talking Google's definition of "beta", it's an "alpha"), so there are lots of rough edges. Right off the bat, here's what bugs me. Hopefully the bugs will get fixed. This next one is probably just something I'll have to get used to. When you go to create a new wave, or add someone to the wave, be careful when you click! Creating a wave or adding someone to it is irrevocable, and the UI doesn't ask you for confirmation, it just shows up in their inbox, and there's nothing you can do about it. I was expecting there to be a confirmation dialogue, in stead, he was added. I hope he enjoys my work. Applications are not easy to find. There's a link to an Extensions Gallery wave in the introductory "Welcome to Google \/\/ave" wave that starts in your inbox, but all it has is Sodoku and half a dozen other apps. I'm not knocking the apps. They're good, but there are a whole bunch more out there that were shown off in the video. After some poking around, I found this list (and this list) of Bots, Apps and Gadgets. The one I was most interested in, Bloggy, doesn't seem like it's working. I added it to a wave, but it didn't do anything. 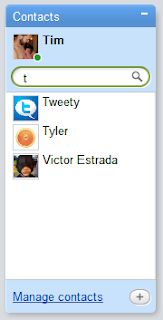 It's supposed to make the wave public and post it to your blog so that everyone (even those not logged in to Wave) can see it, and interact with it if you allow public editing. Hopefully they brought it offline so that they could fix it, and that it will be fixed soon. One last thing, and then I need to go to bed. There's an "Options..." menu item that doesn't do anything for me. I've only tried it in Firefox (and I'm using 3.6b2), but clicking on it doesn't do anything at all. 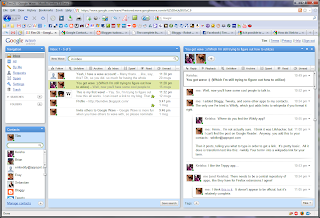 Just so no one thinks I'm being negative, let me state this plainly: I'm VERY excited about Google Wave. I know it's a pre-released product, and I don't expect perfection by any means. I'm documenting these things here because I want to share my experience, and I would like to see the shortcomings addressed so that the final product will be awesome.